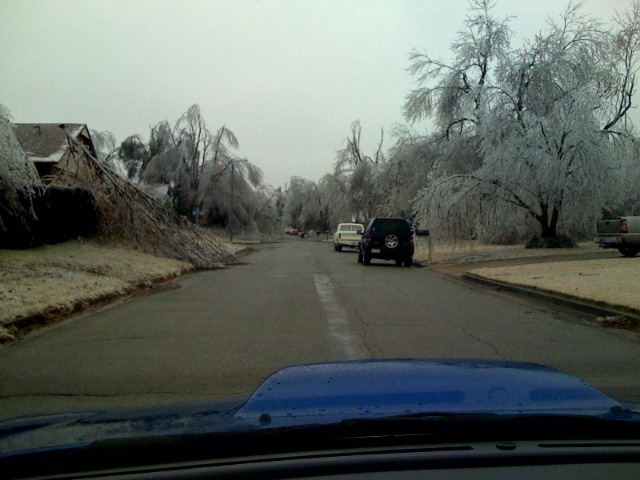 When the ice storm hit Tulsa on Sunday, our home lost power early Monday morning. It wasn’t long before the temperatures in our home dropped to nearly 60 degrees F. We initially planned to “tough it out” but realized quickly that with two young children (1 year and 5 years), it just wasn’t a smart choice. So we packed up some blankets and drove to an area church where the Red Cross had set up a relief shelter for those without heat. I was a bit tentative at first, but our options were limited. When we arrived, we were told that families with young children had the choice of staying in the common area or staying in the various classrooms in the church. The rooms provided a comfortable level of separation where we felt we could keep our children under control, so we chose a room that had one other family in it. After dropping off our things, we went out and bought two air mattresses (which we found out later they were having several dozen brought in that arrived shortly after we returned). Nonetheless, we setup our mattresses and took the kids down to the gym to play ball while we ate dinner. We talked to a lot of parents with kids who were happy to have something to do instead of just sitting in their cold dark home. Most of the people we met were just like us, stuck without power or heat and children that needed to stay warm. While having dinner, I flicked on the iPhone and was surprised to see full signal on WiFi. Yes, while most of the city was without power, cable, internet, and phone, we had broadband at the shelter. There were three of us with laptops, two Macs and a lone Dell. The connection was fast, steady, and a welcome treat for my Internet addicted lifestyle. The iPhone was a great stand-in and I was glad to be able to keep up to date, but it was obvious that AT&T;’s network was getting overloaded with EDGE traffic that sometimes fell back to GPRS. But we were minorities and likely the most out of touch. Pretty much everyone under 30 was keeping in constant contact with friends and family through text messaging. Yes, the generation of text messaging doesn’t bother with e-mail or the mostly unavailable voice. They use text messaging like us old timers use instant messenger. If you have kids, might as well go ahead and plan on that unlimited family text plan, you’re going to need it. By 9:30 PM, we had the beds setup, kids showered and in their pajamas, and were pretty much ready to lay down and get some sleep after two days with little to none. The phone rang – our neighbor was calling to say that the power was back on at our house. I left my wife and kids to settle down and went and checked on the house. Once I was sure the right lights were on, the heater was set to bring the temperature back to normal, and the battery backups were recharged, I shut the door and returned to the shelter. The house would take hours to warm up, we had comfort at the shelter, and we slept the night away without interruption. As we left the next morning, they asked us to fill out a voluntary survey about our stay. We were grateful to have warmth on a cold night, grateful for a hot breakfast and clean, warm showers, and confident we had made the right choice for our children. I guess the take away from this post is always do the right thing for your children and leave your preconceptions behind. And next time you watch the victims of a hurricane in Louisiana, a wildfire in California, or an ice storm in Oklahoma, think twice before you dismiss those who chose to make those places their home.